The Secretary, Abducted Dapchi Girls’ Parents Association, Mallam Bukar Kachalla, has blamed Nigerian military for the tension in Dapchi. He warned that the military should not risk the life of the only Christian girl under the capacity of Boko Haram by engaging them. He said, “We got news again that Boko Haram (terrorists) were bringing the remaining girl and we were happy as usual , only for the military to cordon off the place where the insurgents dropped the other girls on Wednesday. “They are preventing people from moving freely along the main road which passes through Dapchi to Yunusari and Niger Republic. “We are told they want to engage the insurgents in crossfire when they bring the girl and that is what is causing tension in the town. Why would they want to engage the insurgents? Do they want to risk the life of the remaining girl? 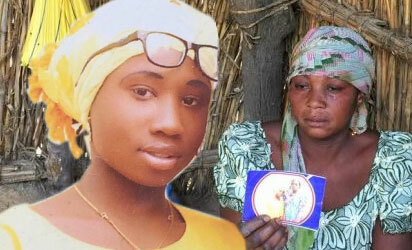 Leah, abducted alongside other 109 girls on February 19, was not among the girls released on Wednesday on the ground that she refused to renounce her Christian faith and wear hijab despite the pressure by her abductors.